Macaroons for Passover. I made them for Easter dinner. Sacrilicious? Grind the almonds in a food processor until mostly powdered. Transfer to a large bowl. Grind the walnuts also until powdered. Add to the same bowl as the almonds. Add sugar, cardamom, egg and egg white to the nuts and mix until combined. Cover with a towel and let it sit for about an hour. Line two cookie sheets with parchment or silpats. Scoop out dough into tablespoon size balls and place about 2" apart on cookie sheets. Flatten each cookie slightly. Make a small indentation in the middle of each cookie with your thumb or finger. 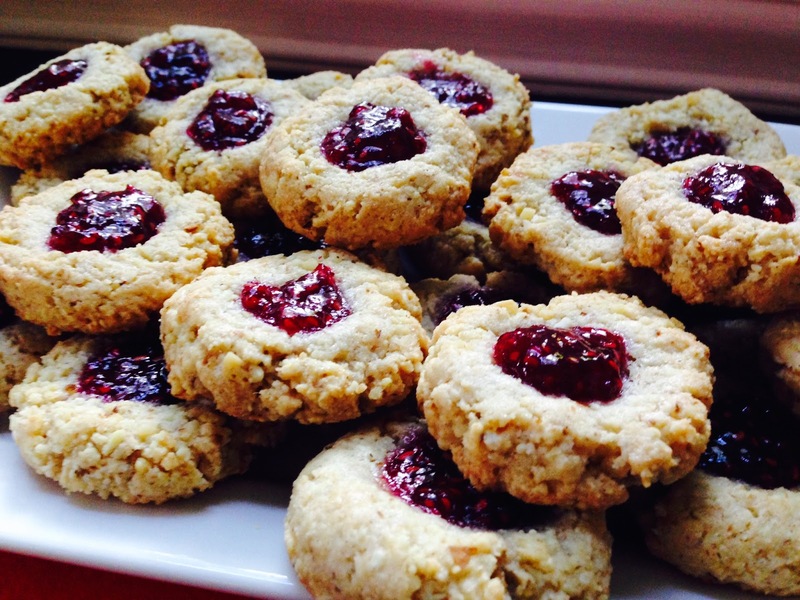 Bake cookies for 15 minutes, then remove from the oven and spoon in about 1/2 teaspoon of jam in each indentation. Put sheets back in the oven and continue baking for another 10 minutes or until golden brown and firm to the touch. Cool to room temperature before serving. Storing: Cookies can be frozen.